The images from that site sometimes resize itself, when they are placed on an another site like that. From viki so small. Yes we need big. It must be finished! We need HV! Oh it's because of the wiki, I never understood why they resize sporadically. To be fair, I don't expect any such big projects in a long time. They seem to be more happy with the Chinese market. Old news. We've known about this since June last year. I'd just make a HoMM3 Complete remake in 3D(big creatures also 2hex - it wouldn't look awful) with HD mod UI shortcuts ideas. 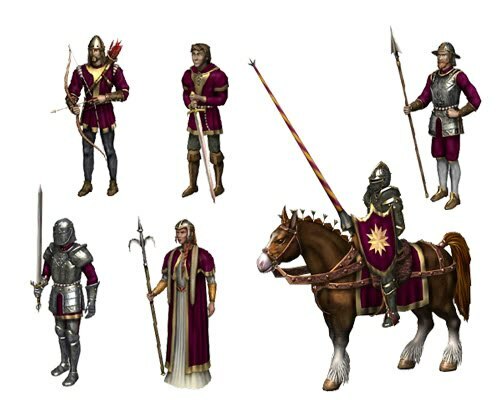 Wish they do models like HoMM5. HoMM6 and HoMM7 units are too much expensive-looking for my eyes. While some part of me sympathizes with the idea of remaking Heroes III Complete, my good sense urges me to repel the thought, because, truth be told, it is not going to work, not matter how hard they try. Heroes III is superb, no question about that, but the mere idea that a product which mimics its carcass could be nearly as superb as the original is foolish, and I give you two reasons for that: first, Heroes III is widely reguarded as the pinnacle of the series, it stands unscathed in the peak of the gaming art. Games can (and constantly are) be compared to it, but itneeds no comparison; it simply is enough in itself, period. That is, a remake would not be a product on its own, but merely a shadow of the original. The second reason is quite more clear in showing why it would not work: nobody can pin the reason(s) why Heroes of Might and Magic III is so goddamn epic. Is it the music ? (Then why is Heroes IV regarded as the ugly duckling of the series?) Is its tremenduously atmospheric graphics ? (could be that too!) But what if we need to include every single element of Heroes III in order to capture its soul? Well, in that case, it just begs the question: "why remake it, then?" Edited by Rakso at 23:38, 02 Feb 2019. @Gandalf196 Yes, you're right. I didn't reconsider it through, out from the developer's point of view on that case. Yup, HotA is doing a marvelous job. Edited by zydar at 04:07, 03 Feb 2019. Heroes 3 is not the future of the series. Heroes 8 should stand at the top of that list. It all depends on Ubisoft and their development studios. I personally wouldn't care for a remake of Heroes 3 of any kind. That game continues to live to a niche portion of players through mods, but in the grand scheme of things it's old and outdated. Today's standards have shifted and would not welcome a title that tries to get by as a carbon copy of something else. Hopefully future devs won't make the same mistake Heroes 7 did, there is no reason for them to pigeonhole themselves into thinking they have to live in the shadow of Heroes 3, or Heroes 5 or any other game in the series. Either they look beyond that or they have already failed. Edited by blob2 at 18:17, 03 Feb 2019. Hopefully future devs won't make the same mistake Heroes 7 did, there is no reason for them to pigeonhole themselves into thinking they have to live in the shadow of Heroes 3, or Heroes 5 or any other game in the series. Either they look beyond that or they have already failed. Being similar to it's predecessors is the only thing this series can go for. We have a few TBS games on the market, but in Heroes series people are looking for something familiar. Let's face it, TBS is a niche genre, and Heroes games will only find buyers in the fans. Which Ubisoft totally blew away. You're able to make a succesful game in the genre (like Age of Wonders 3 for instance), but it will always be a low tier game. That's why it's important to have a solid fanbase which is willing to pay for the games. So the question people at Ubisoft asked themselves was if there is sense in continiuing the franchise in its previous form, or try a different approach which they did. I understand your point Stevie, it is valid, but frankly I think things look rather grim... the franchise was killed off two times already. Edited by Elvin at 09:51, 04 Feb 2019. Well, good luck winning back the community. And ubi is more interested in mass appeal so they'd rather have the series as dumbed down as humanly possible. This isn't even my own conjecture I'm afraid. That's why I mentioned things look grim. I'm almost certain Ubi won't go back to traditional Heroes games, as it just simply doesn't calculate. The only chance would be if some kind of renaissance of TBS games happened and they used a popular IP to attract people, which is very unlikely. Plus they probably wrote off the Heroes community as "toxic" and they won't count on us. Edited by Czarlson at 11:17, 04 Feb 2019. @Stevie I totally agree with you that Heroes 8 should stand at the top. Remake it's the last thing which should be done. Heroes 3 has almost 20 years old and in my opinion this world and the narration should move forward &#8594; new race, heroes, factions, technologies, planets, terrains � etc. Because I'm rather prefer multilayer mode, so from my point of view this game should back to 2D. 2D doesn't mean that game will be awful (example is Hearthstone) but for sure will be more playable. The biggest advantage of H3 it's playable (especially adventure map is transparent and easier to fast game). I have to admit that H7 has beautiful graphics of units and quite nice development of heroes, but this is the end of pros. Development of town has grown too much and for multilayer game this is too slow. At the end I need to mention about technical aspect of H7. Loading times, time of AI turn, and AI are really on the low level. (Doesn't help when the product is released with big number of bugs). In my opinion the core should be prepared for multilayer online game. Like we see HotA online works great � lot of accounts and quite big number active player can be step to success. I hope that in Ubi will be some charismatic and full of passion people like in NWC. You do realize that the boards in Hearthstone are actually full 3d models? Made with Unity. A good example how nice 2D can work are various indie games or Gwent: Thronebreaker. HOMM2 is a souped-up version of HOMMI, and HOMM3 is a souped-up version of HOMM2. I think the reason why the third installment is the best version is because the creator took the original concept, added some structural changes, both in gameplay and graphics, and produced an upgrade every time. Even Armageddon's Blade, and SOD are better versions of the erathia, because of combination artifacts, and a new faction, thus making H3 complete a better version. HOMM4 tried to use a new formula that was distinct from the one that has been working all this time, and since then, they've tried a new formula while trying to revert back to the original one. My point is, if it's not broken, don't fix (or change) it. The maker had a vision, and since new ownership, its been going all over the place. So my point is that if they just kept with the same formula, and made upgrades to gameplay, graphics and added more heroes, factions, and terrains, then the game would continually get better. Afterall, how many versions of Halo are out there when it's really a first person shooter's game?